In the dream I came into a large room that looked styled to the 1950s, it was a kitchen. I was the size of a fieldmouse in this room. I was greated by a proportionately sized large female housewive with blond hair that came down nearly shoulder length into a bob styled haircut, and she had a red ribbon with white polka-dots in her hair. She was wearing a long red dress and had on a white apron, and red high heels. She looked at me and said (I've been waiting for you, come back to mama, come back to mother) and I looked around at the floor where I was being the size of a mouse in front of this normally sized female and there were old crones in black shrouds carrying baskets full of flower petals or some other type of alchemical components. There were a few of these old crones walking around down here with me, they were also the size of field mice. She repeated again that she had been waiting for me and how happy she was that I had found her. I then began thinking oddly and looked upon her sexually. I looked at her legs and began to move towards her, in the dream I flew up to her by my will and as I came up to her she grabbed me up and pulled my shirt up off my back and my 1st person view changed. Suddenly I was looking down at myself as she drew on my back this symbol that is posted above. She told me that we were then bonded and it was the (Magician's symbol of marriage) and then released me and told me to look at her in the eye. I began to look at her in the eye and she said (that's good...very good) and suddenly her image as a large female abruptly went away. and all I saw in the place of where her head was was a white background with a human brain floating in this white background. odd wormlike things scattered from the brain and they had legs like centipedes, and after these wormlike things had scattered two very large bulbous black eyes appeared on the brain. The immediate reaction in the dream was that these were the eyes of an extra-terrestrial, something NOT of this world. and at that point and immediately after waking i feelt extremely confused, if not afraid. Does (ANYONE) have any insight at all as to what this symbol is, or any takes on what this dream means? I communicate with spirits in my dreams and they often come in the guise of a human beings. How do you know if its a spirit or not? I have had waking dreams where I was watching a spirit mount me. 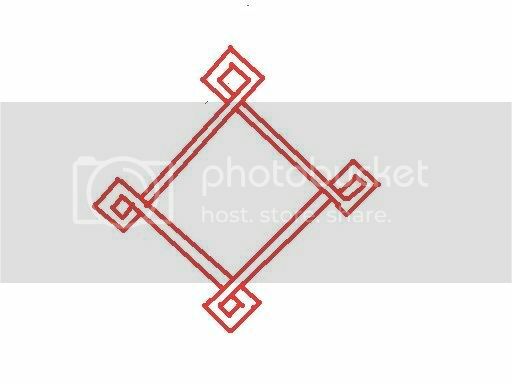 The idea of this being a spirits sigil (and marriages) isn't far fetched.